Note 10 September 2018. The information in the section ‘Getting to and from the ISS’ has been superseded by information in the updated version of this post. This year marks the 20th anniversary of the International Space Station (ISS). The first module of the ISS, called Zarya, was launched by a Russian rocket back in November 1998. Zarya was not an inhabitable module and its function was to provide electrical power, storage and propulsion to the ISS during the initial stages of assembly. Interesting the word ‘Zarya’ is Russian for sunrise and Zarya, being the first step in building the ISS, was to signify a new dawn in international cooperation. 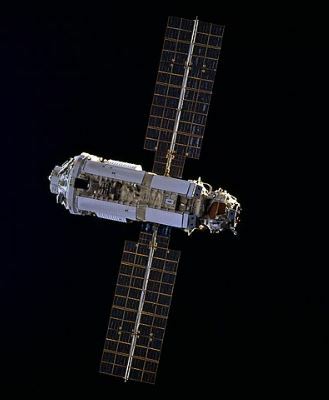 The first module of the ISS called Zarya – Image from NASA Note: the solar panels shown are no longer used and have been retracted. The ISS has a modular design and in the twenty years since Zarya numerous modules have been added, gradually growing it into the structure we see today. A key milestone was achieved on 2 November 2000 when a Russian Soyuz spacecraft bought the first crew to the ISS. The ISS has been manned ever since that date, providing a permanent human presence in space. 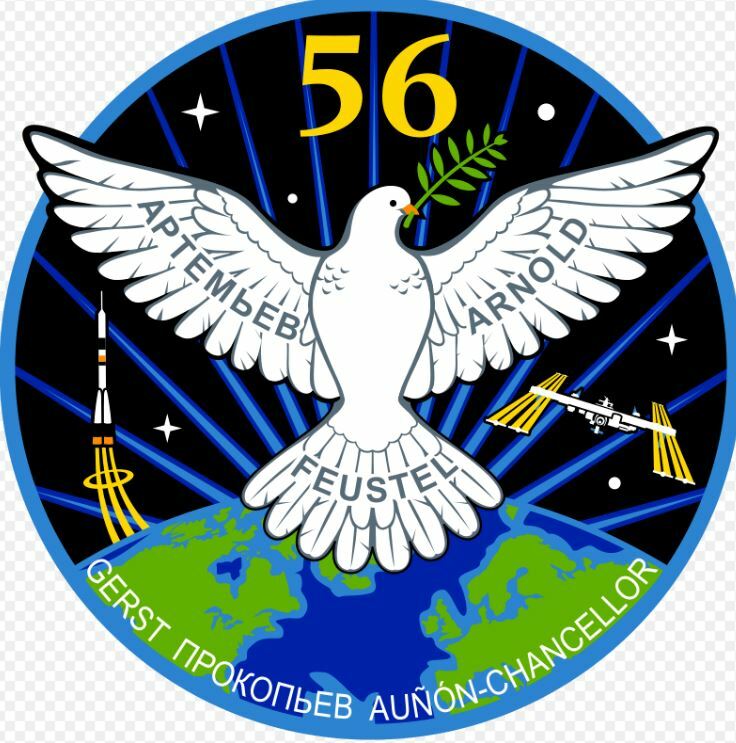 The current crew of the ISS is known as Expedition 56 and consists of three Americans, two Russians and one German. The American Space Shuttle, which flew between 1981 and 2011, was key to building the ISS. 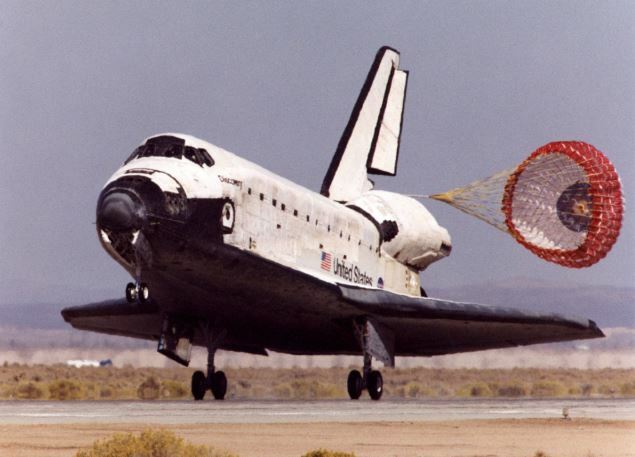 The Shuttle had the capacity to take large modules in its cargo bay and crews of up to six astronauts on assembly missions. Many of these missions involved extended spacewalks. Indeed, without the Space Shuttle it would not have be possible to build the ISS. In fact, post 1998, construction of the ISS became the focus of the shuttle programme. This is illustrated by the statistic that of the 43 space Shuttle Missions flown after the launch of Zarya, 38 (89%) of them went to the ISS to deliver a new module and components to the station, bring fresh supplies or to rotate crew. The ISS is shown in the image at the top of this post. Although a few more construction missions are planned later this year and in 2019, the components to be added are relatively small and construction is essentially complete. The ISS is a very flat structure. It is 73 metres long and a maximum of 109 meters wide, but its maximum depth is only a few metres. It has a mass of 420 tons. Its most noticeable feature are the eight separate sets of solar panels, which look like giant wings and in total generate up to 90 kilowatts of electric power (NASA 2018). The ISS orbit is almost perfectly circular, just over 400 km above the Earth’s surface. 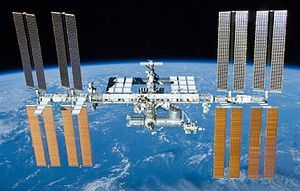 At this altitude, although it is classified as space (which begins at an altitude of 100 km, see my previous post ), there are sufficient traces of the Earth’s atmosphere to cause the ISS to lose energy as it moves against the air resistance caused by this very thin gas. This causes the ISS to very gradually spiral down to Earth as it loses a small amount of energy on each orbit. The distance a satellite drops in altitude is known as its orbital decay and for the ISS is 2 km per month, which works out at about 70 metres per day. If nothing were done the ISS would gradually return to Earth within a few years and as it hit the thicker atmosphere it would disintegrate. To prevent this happening the ISS has a set of thrusters, which are fired periodically to boost it into a higher orbit. Visiting spacecraft also fire their rocket motors to the same effect. Because it is both large and travels in a low orbit, the ISS can be easily seen from Earth. It is visible to the naked eye as a slow-moving, bright white dot. Its brightness is due to sunlight reflecting off its solar panels. The best time to see it is either after sunset or before sunrise, when the station remains sunlit, but the sky is dark. This is shown in the diagram below. 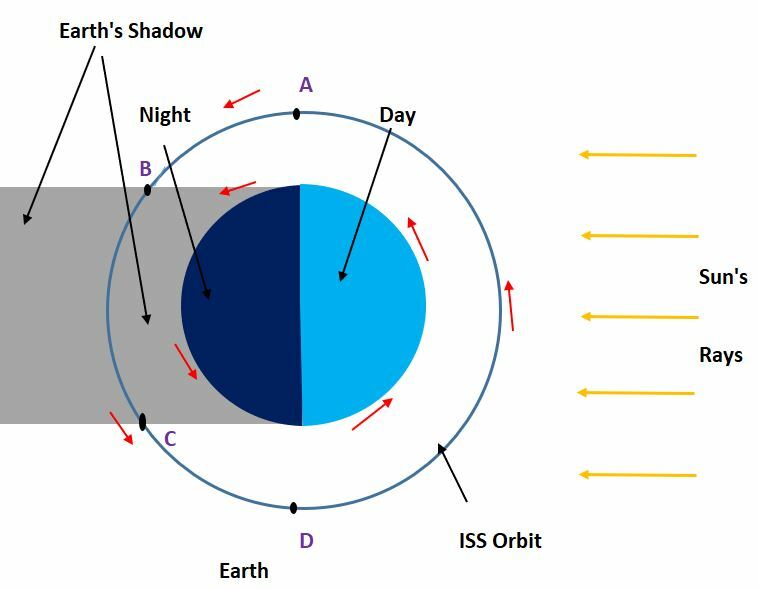 between points D and A, the ISS cannot be easily seen against the brightness of the daytime sky. Because of its size, the ISS is the brightest artificial object in the sky and has a similar brightness when overhead to the planet Venus. A good deal of research is carried out at the ISS. This is described in more detail at the following website https://www.nasa.gov/mission_pages/station/research/overview.html. Much of this research is based upon the fact that that the strength of gravity is very close to zero in the ISS. This is known as microgravity and the only place it is possible to create a microgravity environment for longer than a few minutes is in space. Some examples of this research are given below. Fluids can be almost completely combined in microgravity, so physicists can investigate fluids that do not mix well on Earth. 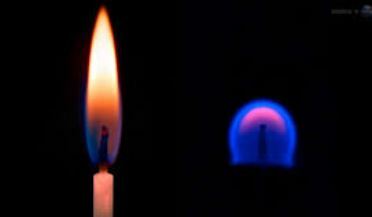 In microgravity environment combustion occurs differently. Flames have a spherical shape. In the diagram below, the candle on the left is in normal gravity, whereas the candle on the right is in microgravity. Research has been carried out as to how plants develop in microgravity. Interestingly, results have shown that plants use light rather than gravity to determine which direction is ‘up’. But perhaps the most interesting area of research are the effects on the human body of spending long periods on time in weightlessness. This area is important, because in the next few decades when astronauts travel to Mars they will have to spend at least six months in zero gravity when travelling to the red planet and a further six months on the return journey. Without any weight to work against, muscles gradually will get smaller and lose their strength. This includes the heart muscle. Fluid shifts around the body causing fluid pressure in the brain to increase. Research on the ISS has shown that to retain their muscle mass, and ensure their heart stays in good condition, astronauts need to spend many hours a day exercising. 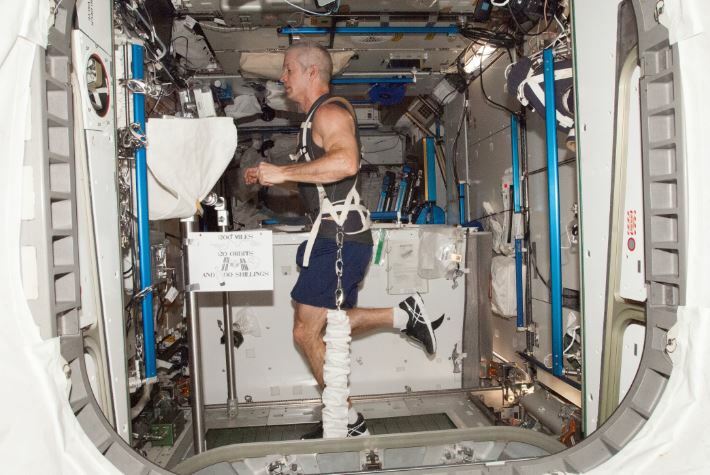 Because there is no weight for their muscles to work against, astronauts often spend a large fraction of the day running on a treadmill, using elastic harnesses to provide resistance. However, nothing has been discovered which can prevent the loss of bone density. The rate of bone loss continues at 1-2% per month and does not level off after long durations in space. After more than two years in low gravity, astronauts’ bones would be so weak they would easily fracture and would be unable to support their weight then they returned to Earth. This may be a limiting factor for how long humans can spend in zero gravity environments, especially since it takes a significant time for the bone density to return to normal. A further limiting factor is that on long duration spaceflights astronaut would be exposed to high doses of radiation. This can cause genetic damage making the astronauts more prone to cancer in later life. Spending time in a microgravity environment causes the spine to elongate. On Earth, gravity keeps the vertebrae in place by constantly pushing them together. But without gravity, the vertebrae will naturally expand slightly, causing a person to become taller. Typically, astronauts in space can grow up to three percent of their original height. 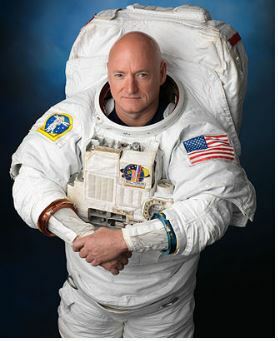 For example, in 2016 when Scott Kelly came to Earth after spending nearly a year in space he was 2 inches (5 cm) taller. However, this gain in height is only temporary. When under the effects of gravity again astronauts return to their original height. Since the end of the Shuttle programme the only way astronauts can get to and from the ISS is by the Russian Soyuz spacecraft, a point worth remembering now that relations between the US and Russia are rather strained. Soyuz was first flown in 1967 and its design has changed little since then. Like the Apollo spacecraft which took astronauts to the Moon, it is a single use spacecraft. The astronauts return to Earth in a small capsule which has a heat shield to protect it during the most dangerous part of the mission, re-entry into the Earth’s atmosphere. Currently NASA pay $70 million for each astronaut who flies in the Soyuz spacecraft (Wall 2013), which enables the Russian space agency to make a significant profit. In the next few years US spacecraft should return to space. Rather than build a new craft to fly crew to and from the ISS, NASA administer a US-government funded programme called Commercial Crew Development (CCDev). After a lengthy evaluation process NASA announced in September 2014 that Boeing and SpaceX had received contracts to provide crewed launch services to the ISS. According to the current launch schedule (https://www.nasa.gov/launchschedule/ ), the target dates for unmanned test flight of both spacecraft are actually this month, August 2018, although precise date haven’t been specified. If there are no further delays and these test flights do take place this month and are successful, then in November 2018 the Boeing CT 100 spacecraft will be the first American spacecraft to carry astronauts into orbit since the retirement of the Space Shuttle. This will be followed by the SpaceX Dragon v2 the following month. I hope you’ve enjoyed this post. In my next post I’ll talk about the costs of the space station, international cooperation in space and how I see the future of the ISS. NASA (2018) International Space Station facts and figures, Available at: https://www.nasa.gov/feature/facts-and-figures (Accessed: 30 July 2018). Really enjoyed your post – so full of interesting nformation. It’s hard to believe the ISS has been out there so long. Yes, very true! Where has the last 20 years gone? Again, another excellent and informative post. Enjoyed it very much!